Uganda’s adorable ambiance generally boasts of attractions ranging from lush forests containing Uganda mountain gorillas, to the snow-capped peaks of the Rwenzori Mountains to the richly endowed Lake Victoria.All these avail various opportunities for memorable Uganda safaris/Uganda tours filled with a variety of activities ranging from mountain climbing treks,Uganda gorilla tracking safaris or gorilla treckking safaris,chimpanzee tracking safaris,Uganda bird watching safaris,Uganda wild life safaris(the big five),cultural tours and community walks,Uganda camping safaris,1 day short Uganda tours e.g the Kampala tour and he Jinja white water rafting along the Nile. On a Safari to Uganda one will discover that Uganda has tremendously developed despite the past history it went through.Notable among this was that during the 14th century, Buganda, Bunyoro, Toro, Ankole and Busoge became Uganda’s primary kingdoms. Uganda remained relatively isolated up to the mid 19th century when the Arabic traders and European explorers established contact. After signing the Berlin Treaty Treaty in 1885, Buganda as Uganda had previously been referred to, came under the British protectorate. A loose coalition led to Uganda’s independence during 1962 bringing into power the dictatorial regime of Idi Amin, which was followed by that of Milton Obote who was over thrown by the National Resistance Movement guerrilla army commanded by Yoweri Museveni.Uganda has however been affected by an overwhelming HIV/AIDS epidemic and an insurgence in Northern Uganda by the Lord’s Resistance Army which has seen increased aid and investment flow into Uganda. Uganda has an approximate population of about 30.3 million. Several traditional ethnic groups still exist today, forming a diverse and complex cultural population ranging from Buganda kingdom down to the Pygmies. Musical histories cant be left unmentioned as they generally prevalent, with various groups having unique musical instruments and histories passed on from generation to generation some of these instruments include drums, the harp and the xylophone and many others.About two-thirds of the population is Christian, notably is that part of the population still practices animism or Islam,cultism as well as witch craft.Food staffs and meals in Uganda are generally centered on sauces made from ground nuts beans or meat; beef, mutton and goat are especially common. The best time to have Uganda safari or safari in Uganda is late December to late February or June to September, as the weather at this time of year is generally hot and dry. The climate is generally agreeable, reflecting the combination of medium altitudes based on the equator. Uganda’s main airport is Entebbe international airport located in the southwest of the capital, Kampala at the shores of Lake Victoria. The major port of entry for air travel is Nairobi, Kenya from which one can easily reach Uganda by bus. Within Uganda one can travel easy by bus, air or car. 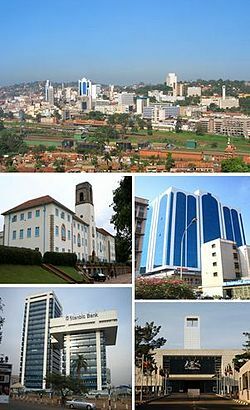 Any one who has had a Uganda safari or toured Uganda before but embarks on a Uganda tour/Uganda safari to date will testify that Kampala has undergone a great deal of development to become a growing metropolitan city compare to its state in the 1990`s. It now has a wide range of modern amenities and is developing at fast rate among many African cities. In both the reconstructed, old and the newly built buildings , electricity is common and reliable, with a fairly safe clean water system, and all sorts of merchandise are readily available in both street markets and stores. Kampala is now brimming with fine restaurants, high quality shopping malls and hotels, nightclubs and casinos a combination that will certainly let any Uganda safari traveler have a comfortable safari in Uganda .